How do I Turn my Boring Block into Something I'll Actually WEAR??? Just a few basic skills are all you need to make a total transformation! If you have your dress block, you might be wondering, "OK, what do I do with this now? How do I turn this boring dress into something I'll actually wear???" 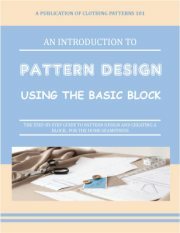 There are almost infinite ways to design your pattern, but this video focuses on the basic techniques you'll use over and over again to design skirts, dresses, pants - even sleeves and collars! You'll need to understand how to manipulate darts (moving them, or converting them into shaping seams that add style as well as fit) and how to slash and spread your pattern. Slashing and spreading sounds kind of scary - but don't worry, you'll never cut up your block pattern! You always trace a copy, and you're free to cut into the copy. 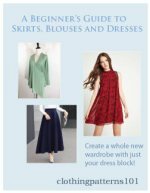 Cutting your pattern and spreading the pieces apart is how you'll transform your straight skirt into a full skirt, or a straight sleeve into a flutter, bell, or bishop's sleeve. And, of course, there are many, many more sleeve styles that utilize the slash and spread technique in A Beginner's Guide to Sleeves and Cuffs. Get out your quarter scales and start practicing!